To Alfred Wainwright, it was the 'daddy of them all.' To romantics of earlier centuries it was a fearful place - bottomless - beyond thought of exploration. To the realists, who were pretty accurate, it emerged down the valley at Clapham Beck Head, and was the entrance to an uncharted maze of passages under Ingleborough. To modern explorers it is simply 'GG' - the greatest and best-loved pothole in Britain. Fell Beck gathers the water from the upper slopes of Ingleborough before plunging into an awesome shaft, 330 feet deep, in a single fall - the highest in Great Britain. The feature is believed to be very ancient - some 350,000 years old. Surface water started seeping through a major joint in the limestone, aligned on a fault, and as the joint widened, more and more water found its way down until eventually it carved out the largest chamber in the country: a colossal space big enough, it is believed, to hold York Minster. Twice a year the public can witness this amazing spectacle. Seasoned cave explorer Tony Waltham, in Yorkshire Dales, Limestone Country has written that, 'there is nothing else in Britain remotely like the winch descent of Gaping Gill. 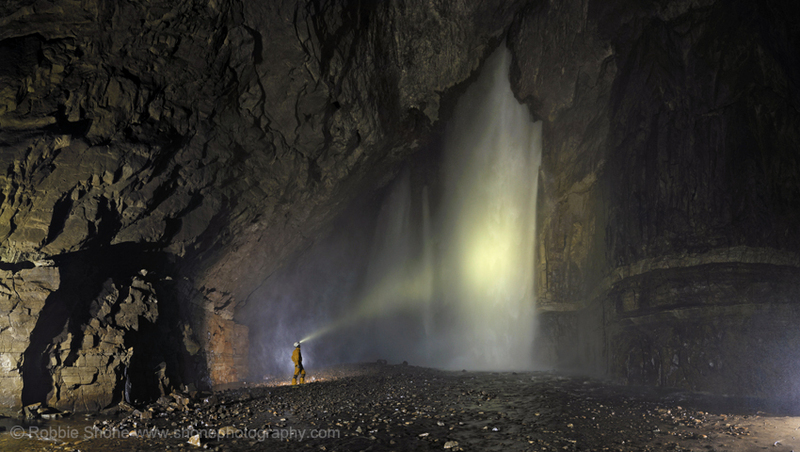 The shaft, the chamber and the waterfalls are in a totally different league from any other British cave.' The Bradford Pothole Club set up the winch over the Spring Bank Holiday, while the Craven Pothole Club have their meet in August. They charge 'the equivalent of four pints of beer' - not to go down, apparently, but to be winched back up!! My friend Craig was having his first ever experience caving - and what a way to start! We headed up to Gaping Gill via Clapdale Farm, on the west side of Clapham. This is an early morning view back over the farm and out to the Craven lowlands beyond the South Craven Fault. Crossing Hurnel Moss on the way to Gaping Gill. The moss itself is home to a famous pothole. Clapdale can be seen in the background with its limestone scars. Bar Pot is the most popular entrance into Gaping Gill for cavers, who need a massive amount of gear for the main shaft itself. A small hole at the bottom of this depression leads to a couple of big drops into the passages beyond the main chamber. In itself, it's a lovely spot. The slopes of Little Ingleborough can be seen behind. Looking down from the rim of Gaping Gill to the dammed Fell Beck. The dam can be seen to the left of the cavers just above the apex of the main tent. The water is diverted down Rat Hole so the winch experience can be as dry as possible. During the winch week and those leading up to it, the moor becomes a 'village' with many cavers staying up here for the full duration. Weather conditions, needless to say, can be horrendous indeed. The damming of Fell Beck in close-up, showing the water disappearing down Rat Hole, itself a massive drop into the main chamber of Gaping Gill. Today the stream was very friendly, fortunately. In heavy water conditions the dam is breached and the winch experience becomes even more white knuckle. The BPC take it all ever so calmly. Pay up your tenner and get a disc with your number - then sign a disclaimer in case the cable snaps - only kidding! Craig and I were 52 and 53 respectively - so not long to wait. The precarious looking gantry is scaffolded into the great shaft and a cable guides the 'bosun's chair' slightly off centre as it descends, to keep it out of the water. The dark hole on the right of the picture is Jib Tunnel, from which the winch used to be launched. Inside are slippery beams over a sheer drop to the main shaft, so never be tempted to explore it. The dangers of Gaping Gill, as Wainwright says, 'are appallingly obvious. A falling body would be swallowed by the black gulf and not come to rest until hitting the boulder floor 330 feet below. Keep children and dogs under lock and key.' AW didn't mince his words. The public can put on one of the club's green oversuits if they don't want to get their best clothes filthy ... or soaked. Number 51 in the chair and ready to go. The plank is pulled out and it's a two minute plunge into another world. Believe it or not, you can even take your flask and butties down. In 2006 I watched a table, chairs and food hamper being launced downwards as a former caver had his 80th birthday party in the main chamber! This short clip shows the rock structure at the top of the shaft, and a BPC lady (who was great at calming people's nerves) briefing an explorer before his descent. 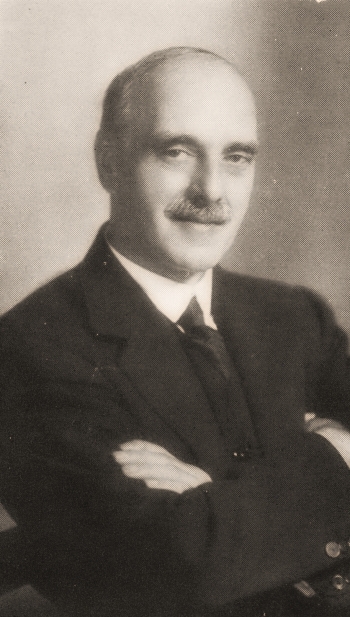 Edward Calvert, of Burley-in-Wharfedale, was all set to descend the pothole in the mid 1890s, having had several attempts thwarted by the weather. He tried to do what John Birkbeck of Settle had nearly done - and get to the bottom of the 'bottomless' shaft. Birkbeck reached a ledge 180 feet down before his rope frayed ... but at least he now has the ledge named after him. Watch out for it as you drop down in the chair. A modest man - if something of an eccentric - Monsieur Martel had taken a flask of rum with him into the main chamber (for warmth), and, when hearing of Calvert's plan to descend, was really upset to have thwarted him. 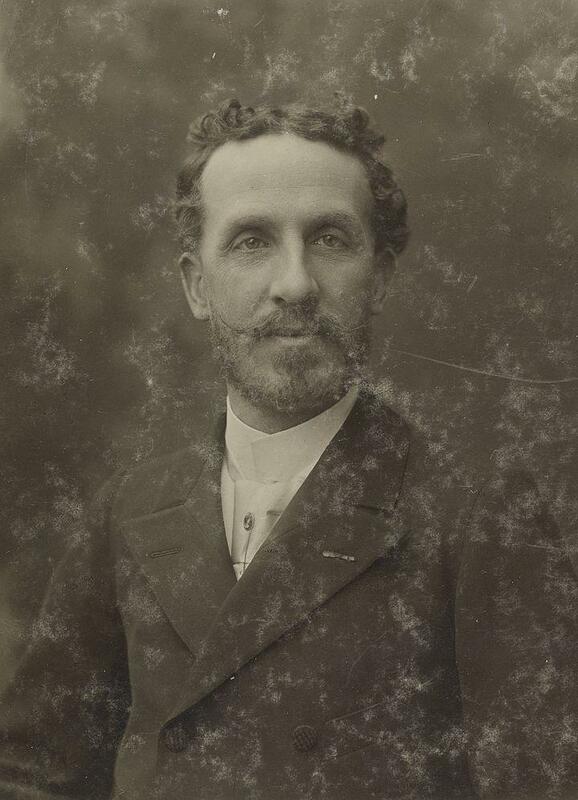 He later said that, had he known of Calvert's plans, the two of them could have 'bottomed' the great hole together. He stayed for a couple of nights with his wife at the New Inn in Clapham, nonchalantly signing the visitors' book with, 'went down Gaper Gill hole today etc.' What a decent chap. These days it takes a lot less time. Join me in the chair and watch the sky disappear, until I had to turn off the camera before it drowned in water! My friend Craig, coming in to land in the Main Chamber. An overwhelming experience. This is the largest cavern in Britain, and the seventh largest natural chamber in the world: 140 metres (500 feet) long, 34 metres (110 feet) high and 27 metres (90 feet) wide. Not bad, for this little island of ours! The lack of light and suspended water droplets mean that the main chamber is notoriously difficult to photograph. This superb image by Brendan Marris shows the true majesty of the vast cavern, including the 'porcellaneous band' of very fine limestone formed from minute organisms in very shallow water. The chamber has one wall inclined at 45 degrees owing to a fault, which has wrenched the rock layers out of position and provided ideal conditions for water to erode this huge yawning space. The water sinks in a bouldery floor believed to be filled with about 75 feet of rubble. Without this, it would be even more massive. It finally emerges, days later, at Clapham Beck Head. This fine photograph by Robbie Shone shows the cascading Fell Beck in flood - a sight that often greets cavers if they come into Gaping Gill from one of the 'more accessible' entrances, all of which still need gear and experience. This is my own attempt at a view up the immense shaft. Birkbeck's ledge can be seen level with the protruding rock on the left - and remember this is already 180 feet from the surface! To take this, I reclined on my back on the chamber floor to avoid hand-shake, as everyone else seemed to be doing!! We looked a real bunch of eccentrics! Filming from a similar position, giving an idea of what a winch descent looks like from the chamber level. A face itself seems to be etched out of the rocky walls on the right. The guiding cable can just be seen under the spray of the waterfall. Looking up at Britain's highest fall, from Britain's greatest chamber. The voice is of the legendary 'Scoff' of the Bradford Pothole Club - who was, as usual, great company for the nervous members of the public. Whoops - he's left his tackle bag behind. Craig's first time caving - and we soon had him in a hands and knees crawl in Old East Passage. The formations in Old East Passage are the finest in Gaping Gill, though they have been spoiled in parts by past generations. Edward Calvert, the first Englishman to descend Gaping Gill, discovered this passage in 1896, a year after Martel's descent. He used only candles to see his way along. This fellow must have been thousands of years in the making. Stalactites surround a huge column. In Old East Passage the formations are 'taped off' to prevent the public destroying them. Please take great care if you do wander in this section. 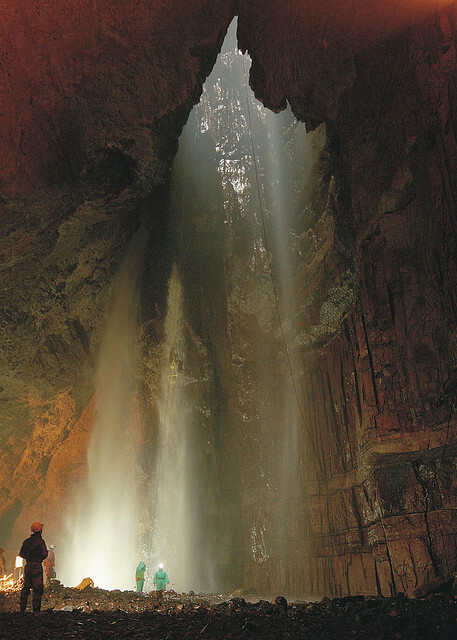 A feature of the Gaping Gill system is that there is hardly ever a solid rock floor, as there is in most Dales caves. The floor here is made of boulders and glacial debris. It is clearly a very ancient passage. The column, for example, is further evidence of this. The Old East Peacock rears his head above the passage. A formation where flowstone has formed over a mass of stalagmite. I see the head of a friendly bulldog here, looking to the right, his ears pricking up to listen for visitors. Interesting features in Old East Passage are never ending. They reach a peak of beauty at this stunning decorated 'grotto' with all manner of formations from straw stalactites, gour pools on higher shelves, flowstone curtains, and, in the centre, a wonderful 'toothed comb' of white calcite. Here's a closer view. Large old passages like this one, with no active water, are ideal for stalactite formation, with droplets seeping their way through the ceiling and meeting the cave air - causing carbon dioxide to diffuse into it so that calcite can be deposited. Some stalactites are well out of the way of visitors and have retained their pure white colour. The Organ Pipes in Old East Passage. The well known founder of the Craven Pothole Club, Albert Mitchell, once led a party through here including a trained musician. After testing the pitch of each pipe gently with her fingers for some minutes, to the impatience of her friends, she proceeded to play the national anthem - and all was forgiven! Mud Hall is down on the left. To cross it, cavers use a traverse line along the right hand wall - with a 140 foot drop down to the chamber floor, and about that much again up to the limestone ceiling. 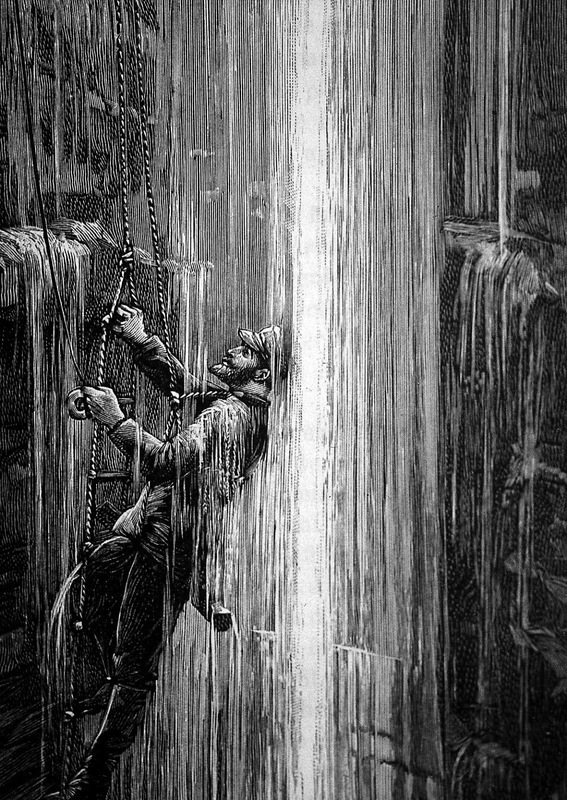 A rib of rock plunging steeply to the left, in the darkness, splits the chamber in two and is descended using ropes or ladders. Mud Hall is scary - even to the experienced. The last few boulders in Old East Passage before all ends suddenly at the abyss of Mud Hall. Sensibly turning back - for a touch more of the wow factor. After sliding back down into the Main Chamber - we headed for South Passage, a completely different section of cave with a smooth sand floor and no sign of stalactites, being further from the surface than Old East. This is easier for the public to reach, but drops to a crawl through the 'Portcullis'. Craig is seen emerging from beneath it. The Portcullis emerges into a high rift passage with Pool Chamber, seen here, leading off. Albert Mitchell once sailed along this on a boat made from bus tyre inner tubes and wooden battens, eventually being tipped off the boat when he meet a stongly flowing canal actually flowing sideways across the passage. He had to make his way out, in full gear, through the freezing cold lake and with no lights. The mind boggles at the great man. Beyond the vastness of Sand Cavern, reached by turning right at a T junction, the impressive Stalactite Chamber is reached. The name needs no further explanation. Far fewer people come this way, as the chamber is cunningly hidden. To reach it, we scaled a mud slope in Sand Cavern and then stepped up a small cliff before sliding down into the chamber. Great fun. These chambers are at a much higher level than South Passage, so water can percolate through to form the stalactites. Long straws forming along the sides of the chamber. Straws and pillars. Hard to believe someone has crawled through and left a scene of destruction. Good cavers would never do such a thing. Final views of the Stalactite Chamber before returning to the winch. Varying ages here - some dating back many centuries. All beautiful. Like a scene from the Grand Canyon, the mud slope in Sand Cavern gives way to this natural step, probably an ancient waterfall that flowed into the cavern before man walked the earth. It is the boundary between Sand Cavern and the Stalactite Chamber. Bottoms up - Craig heading back through the Portcullis. Returning to the surface after four hours underground. The ascent can be more daunting as eyes are well used to the dark, meaning everything can be seen in great detail: drops included. The shaft is 100 feet higher than Malham Cove. Think about that one. Looking back down at the winch, with Jib Tunnel on the right. The author of 'A Three Peaks Up and Under' contemplating getting in his car looking like this. Flood Entrance Pot - another way into the Gaping Gill system for the experienced. Heading off the moor towards Trow Gill. This valley was formed by meltwater at the end of the last ice age, when water couldn't get down Gaping Gill - the great shaft being blocked by ice and debris. Trow Gill itself, a classic example of a meltwater gorge with towering walls of Great Scar Limestone, and a superb dry waterfall. A view south out of Trow Gill, showing the amount of erosion carried out by the meltwater. This is one of the great features of Ingleborough, once believed to have been a collapsed cavern. The valley joins another on the left of the gate, where a tributary of ice flowed down from Clapham Bottoms. The resurgence cave of Clapham Beck Head. In normal conditions it takes the water falling down Gaping Gill (just over a mile away)a full four days to emerge from here, such is the nature of the constricted passages between the two features. The link through to Gaping Gill was finally made by divers in the 1980s. Passing Ingleborough Cave on the way back. Opened by James Farrer in 1837 when he broke down a stalagmite barrier damming a lake, it is one of the great showcaves of the country and we'll pop in another day. The Farrers certainly knew how to show off the grounds of their estate. This lake was made by damming the beck, and fits perfectly into the scenery. A lovely view after the turmoil and stark beauty of Gaping Gill. This calms the senses. Last view of the lake, with the bridge leading through to Clapham Falls. We dropped down Gaping Gill at ten, and were back in Clapham in time for tea! Gaping Gill is the obvious hole at top centre. 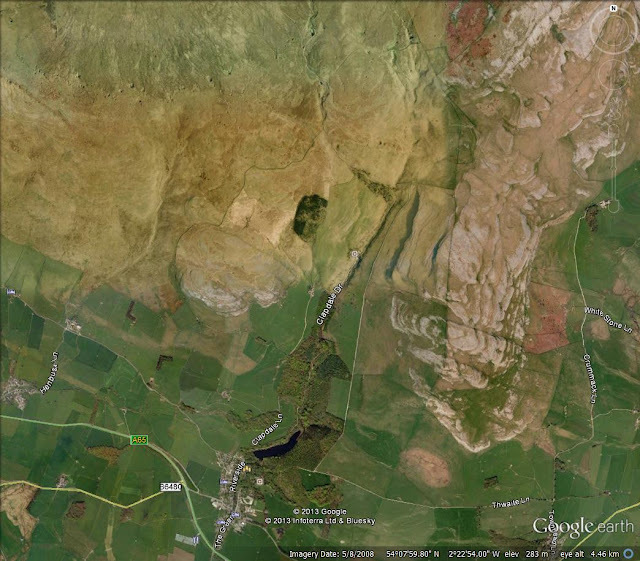 Walk to it from Clapham via the Clapdale Drive Nature Trail, passing Ingleborough Cave and Trow Gill. The winch operates in May and August each year. Check the caving club websites for more details. This is a day out like no other and is a life experience to be savoured. Gaping Gill is truly magnificent. Excellent write up mate. Stirred some memories did that.